I need to say her name without bringing everyone to tears. I need her life to be included in the count of children, grandchildren, nieces and nephews. I need kindness on birthdays and understanding on holidays. I need to stay in bed and a reason to get out of it. I need to talk endlessly and to let the phone ring. I need an extra hug and respect for my space. I need someone to ask how I’m doing and want to know the real answer. I need careful announcements of pregnancies, baby showers and births, mine did not turn out as I hoped. I need a “handle with care” sticker for my heart, my emotions have been fragile since the day I said goodbye. I need patience and reminders for my mind, part of it will always be somewhere else. I need forgiveness for not being the friend, sister, daughter and wife I used to be. a lifetime is an impossibly long time to wait to hold my child again. To get all of my posts, you can subscribe to this blog by email or on bloglovin’ or visit my Facebook page. You can also find me on twitter and look for my first book to be out soon! If it felt impossible to fathom the grief over losing a child before, it is no more. So sad, so eloquent, yet so beautiful all at once to read. Thank you for being you. Aww, thank you so much Julie Anne. Truly appreciate you reading and such kind words. Oh my gosh. I can practically feel the ache. This is a powerful post. What I’ve been struggling to express you have so eloquently done in your post. A few weeks ago we lost our sweet, 9-year-old daughter just two days before her birthday and six days after her leukemia diagnosis. While I feel blessed to have had nearly 10 years with this remarkable child, it seems that a lifetime is much too long to see her smile, hear her laugh, and feel her warm embrace. Thank you for these words- the ones I havent been able to express. I miss my girl every second of every day. Bless you. Thank you for writing this Jessica. It’s such an important post for all of us. 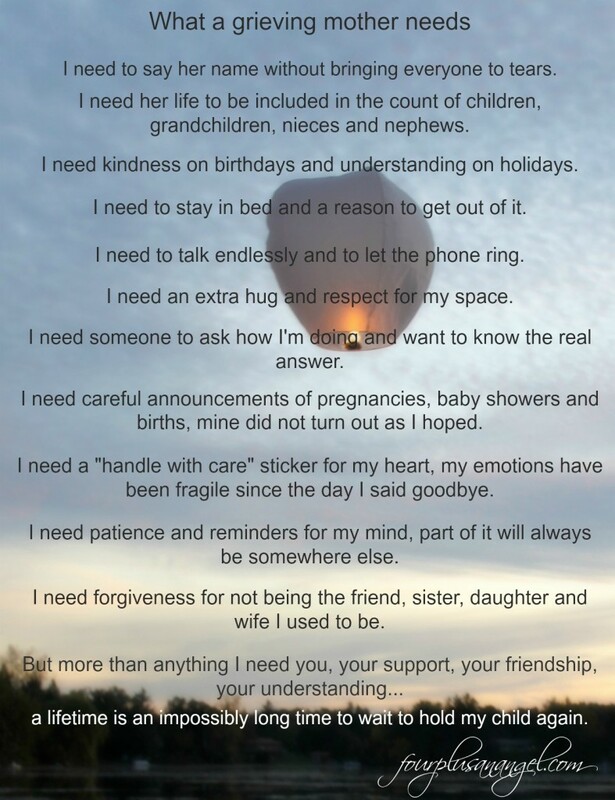 We need to understand how we can support and love someone who has lost a child. Thank you for your comments on this subject. I am so lucky to have found your blog and this post in particular at this time. I appreciate having been directed here. This is perfect. Very touching, Jessica. It brought tears to my eyes. It is so spot on and hopefully helpful to those people who feel like mentioning your child will somehow bring a sad memory, instead of validating their life and the gift and lessons they brought to this world. Thanks so much for reading Karen. I love this post because it’s so true and so helpful. My dear friend just lost her almost 5-year-old daughter and I’m going to pass this on to her. I already thought I “got” it, but after reading this, I know I wasn’t even close. I love you. I learned how to relate to grieving people when my brother committed suicide. I learned how to grieve with the world when I worked with the orphans in Africa (and carried a dead baby to be buried). Now I can relate to the grieving moms after my late miscarriage. It always seems like there is a new pain out there to be experienced. But I almost think that once you’ve been touched by grief – really touched – you are forever able to just be with those who are grieving, because you’ve been there. I couldn’t agree more Jennie, once you have been through it you are not afraid to sit next to it. i love this post Jessica. Such beautiful truth. Oh, Jessica. This is beautiful. And, it’s not even 8 am in the morning here, but I’m already crying. I appreciate this on so many levels. Thank you for voice to those of us who have lost a child. So sorry for the tears but glad that I can be someone who you can relate to Jessica. Thanks for speaking for so many grieving families. Thank you for posting this very nice post. Thank you for sharing what your heart wants to say. Thank you for this. We want to know how to help, how to be the friends that our friends need. Thank you for helping us know what to do. And a big huge hug to you. Or perhaps a friend to hold a punching bag. I’m game for either. Ache is definitely the right one. Thank you for your friendship Holly. Asking for what you need, and elegantly. Would that we’d all learn to hold each other so tenderly, no matter what the heartbreak. Yes to every single one. This is absolutely perfect. Your needs are simple, my dear, sweet, lovely friend. This is so beautiful. I am so glad to have known your story and your struggle. It helps me be a more sensitive and understanding friend. You are a blessing in my life and I’m grateful to be able to share this wonderful community of friends with you. Oh wow. Yes. A lifetime is so very long. I can only imagine you’ve had to hear people tell you (perhaps doing their best but failing??) how lucky you are to have the children you have. I’m so sorry. What an impossible situation you are in – to know that people have good intentions but can’t quite get it right; or are too reluctant to try. Please know that if my words are ever wrong, it’s not due to a lack of support. Oh my. How I wish I knew the right thing to say. But instead. I read. (Which is like listening, right?) And I hope you never stop sharing. Because we’re with you in this lifetime as you wait. My son died three years ago, tomorrow. It never goes away, never leaves you. But with the grace of God and good friends, it does get easier. Oh wow Lizbeth, this time of year must be incredibly difficult for you. Wishing you moments of peace tomorrow. I love you and your writing! This is such a beautiful post! Your beautiful words bring tears to my eyes. I’m so sorry you know this feeling. You are a master at gut-wrenching closing statements that really hammer home your point (and often elicit a small, choked sob from me). I’m sure other parents who have experienced loss will be able to relate to this, Jessica. Well said. Can I just sit and hold your hand? I wish I had words that could help. This is so beautiful. Powerful. Thank you for sharing your heart. Thanks so much for this post. I lost my 9-month old niece last week, and while I’m still dealing with my own grief, I feel so lost as to how to help my sister through this. The handle-with-care sticker on the heart speaks volumes. Thank you… and big hugs to you. Oh I am so sorry for your families loss. The pain of it all can be unbearable. Wishing you and your family moments of peace. Please let me know if there is anything I can do. Gorgeous post. It really resonated with me. Thank you for sharing. Very beautiful and true. It touched my heart in many ways.. So beautiful, so eloquent. Moved me to tears. Ps My closest friend suffered the loss of her first child, born at 39 weeks and has had 4 healthy babies since. She doesn’t often talk about her first — and I respect that, he was her first, her child not mine. Sometimes I wish she’d open up and talk about him more, but I am always there for her — as your friends — physical and virtual – are for you. So glad you are such a great friend to your friend. I have friends who I have never talked to since my loss, I think they just didn’t know what to do with me when I was grieving so intensely. Love you too, appreciate your friendship more than you know. Thank you for sharing this because it is hard for me to find the right words to say. But I know to make the person know that I’m always there for them. I read this on my iPad earlier, but had to come back and comment. I can’t pretend to understand what you’re feeling. My heart breaks for you. You are entitled to grieve when you feel like grieving. Sending up a special prayer for your aching heart. Thank you so much Courtney. It takes so much emotional energy to say these things, write them down and let us read them and understand. Thank you. Reading your post brought emotions flooding back that I haven’t felt in almost four years. I delivered triplets in August of 2007 at 27 weeks and 4 days, 6 weeks later my little girl Jordyn was given her wings. I too look at my girls today and wonder what she would have been like. I await the day I get to be with her anxiously, it does feel like forever. My girls were diagnosed with Autism in July of 2010. Thank you for your wonderful blog and I will pray for you and your family! I put my email above, please feel free to write if you ever want to share your feelings. Take care. Wow we have quite a bit in common. My daughter who passed was one of triplets as well and I also have a daughter with autism. There is a facebook group for moms who have lost one or more triplets. If you are on facebook I would love for you to join us. Let me know if you are interested and I will send you an invite. Beautifully written, Jessica. I hope that you’re getting what you need and I am so, so glad that you you wrote it here. Much love to you. I am two plus an angel so I understand your list. I feel your pain. I hope blogging about it helps relieve your pain a bit. It usually helps me quite a bit. And you do an amazing job. I truly don’t know where I would be if I didn’t have your support, if only you could all move next door. Jessica, thank you for sharing your heart here with us. I am so sorry for all your suffering. Hugs to you! Thanks so much Christine, so glad we’ve connected. Beautiful post. My heart hurts for you and I agree, a lifetime is much too long to wait to hold your child. You are so strong and amazing. Thanks so much Deb, there are times I do okay and times that the reality of it all is just too overwhelming. Just absolutely what I want to say but never have been able to do so – with such eloquence. I vacillate between trying to forgive those who cannot understand as they have never walked this journey, and feeling so incredibly hurt because it doesn’t take much for me to feel as if my lost baby is remembered. It’s all we have, isn’t it? Remembering the day they were born, they day the died and the short-short space between (if there even was a space…in my case there was not). It is not much too much to ask that others can say our babies’ lovely name without the hushed whisper of what always feel like shame to me. Hugs. I’m glad and sorry that you can relate at the same time Eve. There are so many little things that can make the hard days a little bit easier. So glad you commented, off to visit your blog. Thank you for sharing your heart with us. I know that it can be difficult for me to know what to “do” in a grieving situation, and I truly take your words to heart and try to remember them. I’m so glad Angela. I remember the old me “before” and that I had no idea what to say or do either. I think that is why I always try to share my thoughts honestly. It is 100% ok to need these things!! This is so beautiful. While I do not understand how it feels I know that my mom does. My mom still grieves for my sister and it has been over 32 years. I can imagine although 32 years of living with grief just sounds overwhelming but the feelings never do go away and I’m sure your mom must feel that way. This is beautiful and heart-wrenching. I cannot imagine this kind of loss. You are strong! Thank you so much Teresa. This is a really beautiful post. Never apologize to any person for your need to grieve in your own way. Your daughter is your daughter, whether in heaven or here on earth. My baby brother was stillborn 22 years and 6 days ago. Every year we kids still get my mom flowers and make sure to spend extra time with her on our brother’s birthday. He is part of our family. Always. I love that you do that for your mom. It is so comforting to me that, as my kids grow, they keep Hadley’s memory alive as much as I do. I’m sure your mom loves that you remember with her. I think you are helping so many people…from the grieving parents to the people that want to help the grieving parents but just don’t know how. I’m so sorry you’re one of the grieving. I can’t even imagine the ache you must always be feeling. This was a beautiful expression of your heart. Thanks so much Liz, there are days that the ache is more intense then others and honestly, it’s a little overwhelming to know it will always be there but if it wasn’t I would not be remembering her. Thank you for opening your heart and sharing this with us. Beautiful post – thank you for writing it. I could not agree more with every one of your needs (especially the one for forgiveness and for support, friendship and understanding). I wish we could too Lanie, sometimes the reality of it all is just overwhelming. I think that is the place I have been stuck in lately.